Special sales, events, and programs demonstrating the quality and versatility of NAERIC horses. 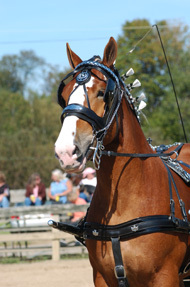 All breeders of quality draft horses are invited to become members of the NAERIC Draft Horse Classic committee and participate in this unique program. NAERIC is pleased to announce the launch of the new NAERIC Barrels of Cash Sale and Futurity in 2008 to reward and recognize the quality, versatility, athletic ability and disposition of NAERIC registered horses. Only foals sold through the NAERIC Barrels of Cash Sale will be eligible to return and compete as five-year-olds in the NAERIC Barrels of Cash Futurity. Consignors will pay $250.00 to the Futurity purse for each weanling sold. All Sale weanlings will be NAERIC registered and eligible for rewards through the NAERIC Advantage. The NAERIC Advantage is a second-generation program designed to replace the NAERIC Incentive Program. The NAERIC Advantage will offer added money for NAERIC registered horses competing at selected events across the United States and Canada. The Young Horse Development Project was launched from a partnership forged between Manitoba 4-H and the Manitoba Equine Ranching Association (MERA). One of the greatest sources of quality sport horses in North America! The NAERIC Versatility Ranch Horse Stake is a stake class held in conjunction with an AQHA approved show or special event for registered Quarter Horse, Paint Horse and Appaloosa three-year-olds sired by NAERIC-member owned stallions.